NEW DELHI: Prime Minister Narendra Modi on Sunday promised to get back every penny of the black money stashed abroad, days after his government was accused of making a U-turn on the issue. NEW DELHI: CBI is likely to convert into FIRs the preliminary enquiries against Jindal Steel and Power Ltd and JSW Steel for alleged diversion of forest land for their plant in violation of norms and may also examine former Environment Minister. CHANDIGARH: Haryana Chief Minister Manohar Lal Khattar on Sunday said the law will take its own course on the land deals in the state involving businessman Robert Vadra's company. MUMBAI: Maharashtra Chief Minister Devendra Fadnavis on Sunday allocated portfolios to his 10-member Council of Ministers while keeping the Home, Urban Development, Housing and Health departments with himself. NEW DELHI: He might be revered as the 'God of Cricket' but there was a phase in Sachin Tendulkar's awe-inspiring career, when the batting maestro felt so "scarred" and "devastated" by the Indian team's ineptitude under his captaincy that he wanted to completely move away from the sport. 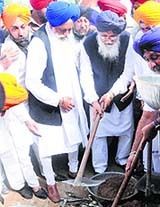 Punjab Chief Minister Parkash Singh Badal today asked the government to identify and punish political leaders and police officers responsible for the killing of thousands of innocent people during the 1984 anti-Sikh riots. Why it is relevant even after three decades to talk of the denial of justice to the victims of the anti-Sikh riots. Apart from justice, punishment is meant to act as a deterrent, so a message goes that no one is above law. With a smartphone in his hand, Prime Minister Narendra Modi today became the first online member of the BJP. The Sonepat police are painstakingly sifting through the affidavits from the victims of the Gohana bank heist to ascertain the exact details of their stolen valuables. 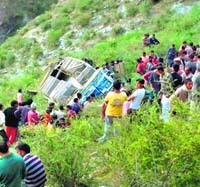 Fourteen persons were killed and 10 others injured when a private bus (HP-73-1568) fell into a deep gorge in the remote Salooni area of Chamba district. People gather near the ill-fated bus after the accident. The National Human Rights Commission (NHRC) today directed the Delhi Government to pay Rs 25,000 each to 12 African women who were �victims of racial prejudice and unlawful acts� during a midnight raid in the Khirki Extension area in January.